Astronomie - Watch a Meteor Smack the Blood Moon in This Lunar Eclipse Video! Raumfahrt - This massive rocket creates a fireball as it launches, and that’s by design No, the rocket isnt about to blow up—its just physics in action. Raumfahrt - Can anyone own the Moon? Astronomie - Information and demons: what to look for in the search for ET Agreeing on a standard definition of life is a metaphorically bedevilled exercise, writes astrobiologist Paul Davies. Astronomie - Has LIGO Seen Galaxy-Warped Gravitational Waves? Rock fragment from Earth via the Moon. Scientists discover what may be Earth's oldest rock in a lunar sample returned by the Apollo 14 astronauts. The research about this possible relic from the Hadean Earth was published in the journal Earth and Planetary Science Letters. An international team of scientists associated with the Center for Lunar Science and Exploration (CLSE), part of NASA's Solar System Exploration Research Virtual Institute, found evidence that the rock was launched from Earth by a large impacting asteroid or comet. This impact jettisoned material through Earth's primitive atmosphere, into space, where it collided with the surface of the Moon (which was three times closer to Earth than it is now) about 4 billion years ago. The rock was subsequently mixed with other lunar surface materials into one sample. The team developed techniques for locating impactor fragments in the lunar regolith, which prompted CLSE principal investigator Dr. David A. Kring, a Universities Space Research Association (USRA) scientist at the Lunar and Planetary Institute (LPI), to challenge them to locate a piece of Earth on the Moon. Led by research scientist Jeremy Bellucci and Professor Alexander Nemchin, team members working at the Swedish Museum of Natural History and Curtin University in Australia rose to the challenge. The result of their investigation is a 2 gram fragment of rock composed of quartz, feldspar, and zircon, all commonly found on Earth and highly unusual on the Moon. 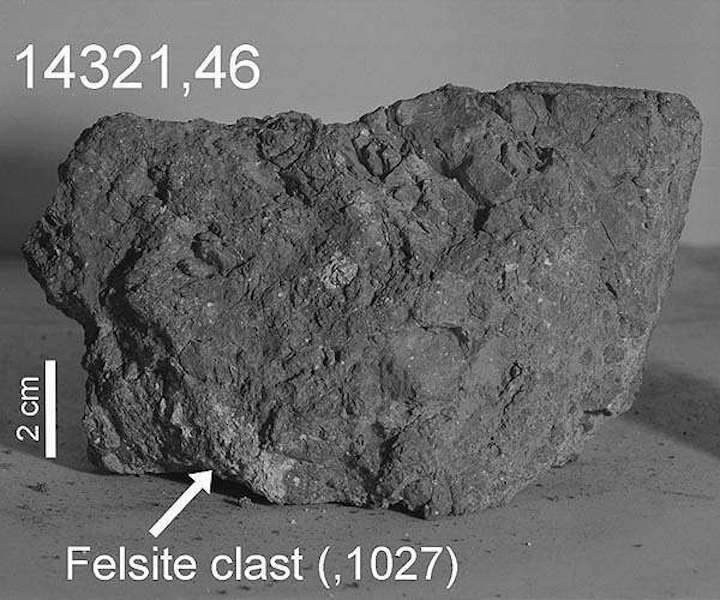 Chemical analysis of the rock fragment shows it crystallized in a terrestrial-like oxidized system, at terrestrial temperatures, rather than in the reducing and higher temperature conditions characteristic of the Moon. "It is an extraordinary find that helps paint a better picture of early Earth and the bombardment that modified our planet during the dawn of life," says Dr. Kring. It is possible that the sample is not of terrestrial origin, but instead crystallized on the Moon, however, that would require conditions never before inferred from lunar samples. It would require the sample to have formed at tremendous depths, in the lunar mantle, where very different rock compositions are anticipated. Therefore, the simplest interpretation is that the sample came from Earth. The team's analyses are providing additional details about the sample's history. The rock crystallized about 20 kilometers beneath Earth's surface 4.0-4.1 billion years ago. It was then excavated by one or more large impact events and launched into cislunar space. Previous work by the team showed that impacting asteroids at that time were producing craters thousands of kilometers in diameter on Earth, sufficiently large to bring material from those depths to the surface. Once the sample reached the lunar surface, it was affected by several other impact events, one of which partially melted it 3.9 billion years ago, and which probably buried it beneath the surface. The sample is therefore a relic of an intense period of bombardment that shaped the solar system during the first billion years. After that period, the Moon was affected by smaller and less frequent impact events. The final impact event to affect this sample occurred about 26 million years ago, when an impacting asteroid hit the Moon, producing the small 340 meter-diameter Cone Crater, and excavating the sample back onto the lunar surface where astronauts collected it almost exactly 48 years ago (January 31 to February 6, 1971). Kring suspects the conclusion of a terrestrial origin for the rock fragment will be controversial. While the Hadean Earth is a reasonable source for the sample, a first find of this kind may be a challenge for the geologic community to digest. He notes that samples of Hadean Earth certainly peppered the lunar surface; other samples will likely be found with additional study.